Obituary for Mildred Covington Williams | McGuire Funeral Service, Inc.
Mildred Covington Williams, 99, departed this life at Oak Manor Healthcare Center. She will long be remembered as a nurse at Garfield Hospital in the Washington Hospital Center. 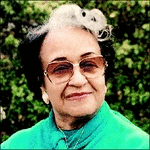 Born in Washington, DC, she was the loving mother of Diane W. Phynes and her late husband Herman W. Phynes, III of Columbia, MD; adored grandmother of Charlotte Phynes Garcia and Adam T. H. Phynes; beloved aunt of Karolyne G. Smith and Stephanie Holder. She is also survived by a host of other relatives and friends.